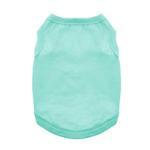 Our Barking Basics!® Dog Tank Shirt in teal is the perfect shirt for almost any dog at an exceptional value! This Barking Basics!® Dog Tank Shirt in teal is sure to be your dog's favorite with a comfortable fit and 100% breathable cotton. Great on its own or use this tank year round by layering it under coats and sweaters to help keep shedding down and for extra warmth. Have the dog help your event be even more special by designing these tanks for graduation parties, baby announcements, birthdays, baby or wedding showers. You could also customize these for a charity or pet events. The sky is the limit! The easy-care soft knit is made of 100% cotton. Machine wash, cold and dry flat for best results. Posted On 04/09/19 by Denise N from , NY Yes, Denise N recommends this product! Great tee, made very well. It is listed as teal, I see it more like a very pale mint. Perfect for spring/summer, Easter. Super soft material. I havent used this Dog Tank Shirt yet I but love this color light teal for our red mini doxie! And just trying to prepare for Spring coming ! Posted On 01/01/19 by Jennifer L from Senoia, GA Yes, Jennifer L recommends this product! We love these as night shirts but def cute enough for everyday wear or layering! Posted On 09/26/18 by Bellathemalshi21 from Elizabethtown, KY Yes, Bellathemalshi21 recommends this product! Came exactly as pictured and fits perfectly! Love this color!